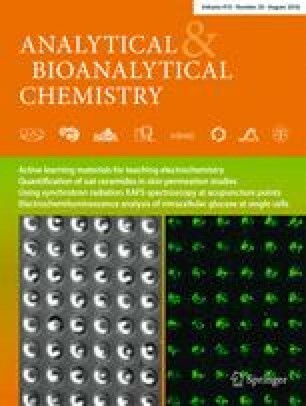 This investigation was undertaken to explore the mutual recognition of the pentapeptide (ValGlyGlyValGly)n, a hydrophobic elastin-like peptide (ELP), suspended in deionized water in monomer (n = 1) and trimer (n = 3) forms and the outer surface of a very thin, insulating polymer, poly(ortho-aminophenol) (PoAP), electrochemically grown on a platinum foil by cyclic voltammetry in a neutral medium (phosphate-buffered saline, I = 0.1M) immersed in the suspension. As a prior task, the proved propensity of the ValGlyGlyValGly sequence, at the given minimal length (three or more repeats), to self-assemble into amyloid-like fibrils when solubilized in an aqueous environment was considered within the framework of testing PoAP surfaces for the specific detection of amyloid precursors. From our knowledge of the chemical structure and physical properties of both biomacromolecule families obtained in previous studies, we focused on the efficacy of the binding sites offered to ELP fibrils by PoAP in its as-prepared form or properly modified either by postsynthesis oxidation or by adsorption/entrapping of ELP monomer(s) with or without protecting terminal groups. Consistent with all methods of preparation, the best surfaces, recognizable by the trimer fibrils, are those modified to carry a larger number of carbonyls, particularly by entrapment of ELP monomer(s) during PoAP electrosynthesis using an imprinting-inspired method. The degree of attachment of fibrillar aggregates, detected by atomic force microscopy and X-ray photoelectron spectroscopy, provides unequivocal evidence of the cooperative forces involving PoAP–ELP interactions. 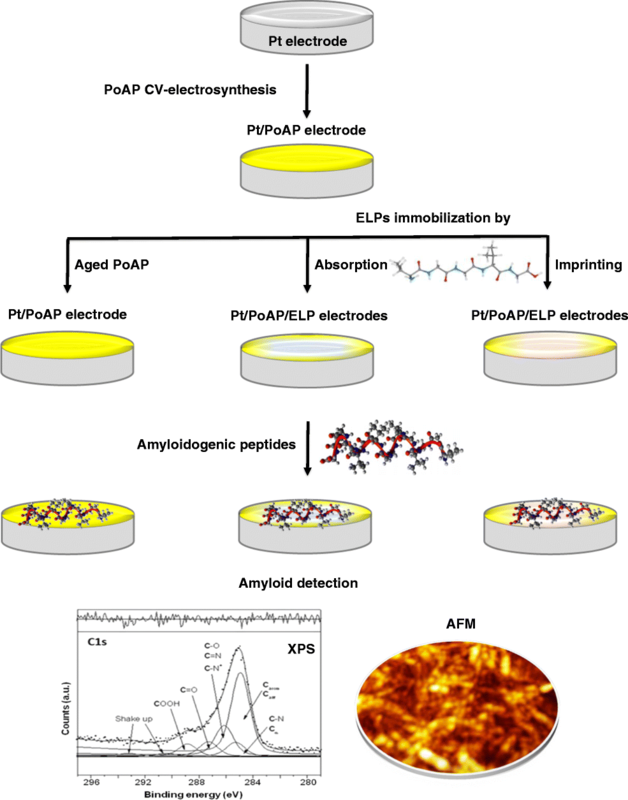 The results obtained suggest the prospect of using the proposed Pt/PoAP/ELP systems as biodetectors in Alzheimer disease. The online version of this article ( https://doi.org/10.1007/s00216-018-1142-3) contains supplementary material, which is available to authorized users. The authors are grateful to Fausto Langerame for acquisition of X-ray photoelectron spectra and technical assistance. The Surface Microscopy Laboratory of the Science Department (University of Basilicata) is acknowledged for the use of electrochemical and atomic force microscopy instrumentation during the PhD studies of MEC (A.Y. 2015-2016). NIST (National Institute of Standards and Technology), X-ray Photoelectron Spectroscopy (XPS) Database. https://srdata.nist.gov/xps/main_search_menu.aspx. Accessed Dec 2017.